You can buy the converters or parts to make your own from the Keiō web site. You can also download the manual. 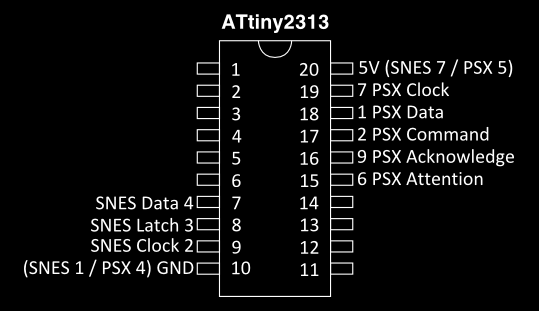 Each converter supports several different button mappings based on the layouts of popular games. The mappings match the arcade layouts and default settings in games so you can play without having to remap in-game first. 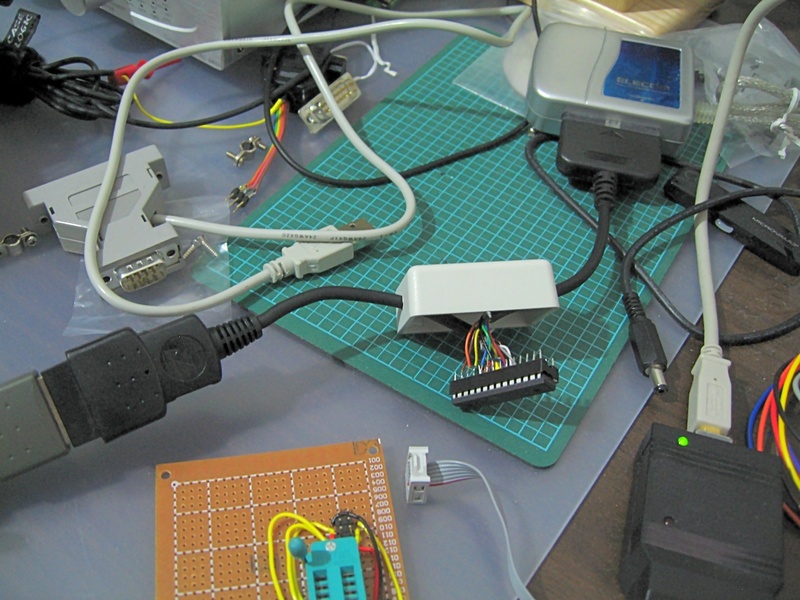 Some special controllers are also supported with specific mappings. There is no lag between the controller and the console. Using the adapter is transparent and works exactly the same way as an official controller would. Autofire is available in two or three speeds (depends on button mapping selected) and can be set to be either on or off by default with a button to switch states. Tournament mode disables the start button and autofire. This is ideal for competitive play and prevents you accidentally pausing the game during a match. 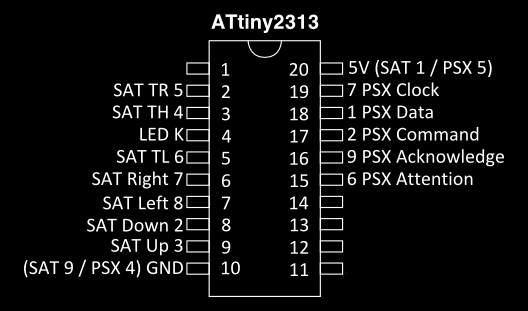 The design requires only one part minimum: the ATtiny2313 microcontroller. 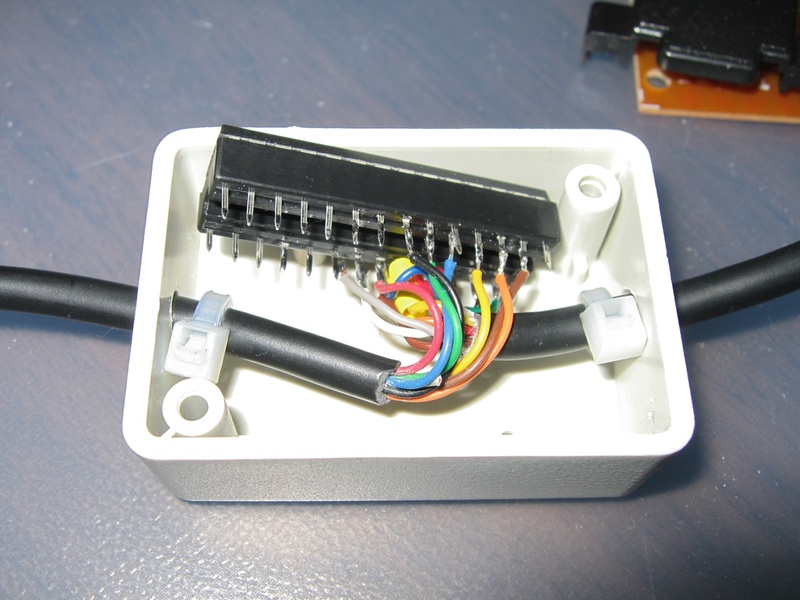 In practice you may want to use a DIP socket to avoid soldering wires directly to the chip and a power supply filtering capacitor is recommended, but there is still no need for a PCB or any other parts. 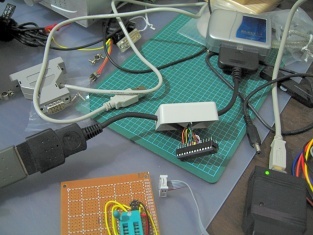 The Saturn version has an optional LED to show when a controller is connected. Official Sega Saturn pads (Japanese, European or US style) are supported. The NiGHTS Analogue Controller is also supported, but only in digital mode. Third party pads should work but are not guaranteed to. 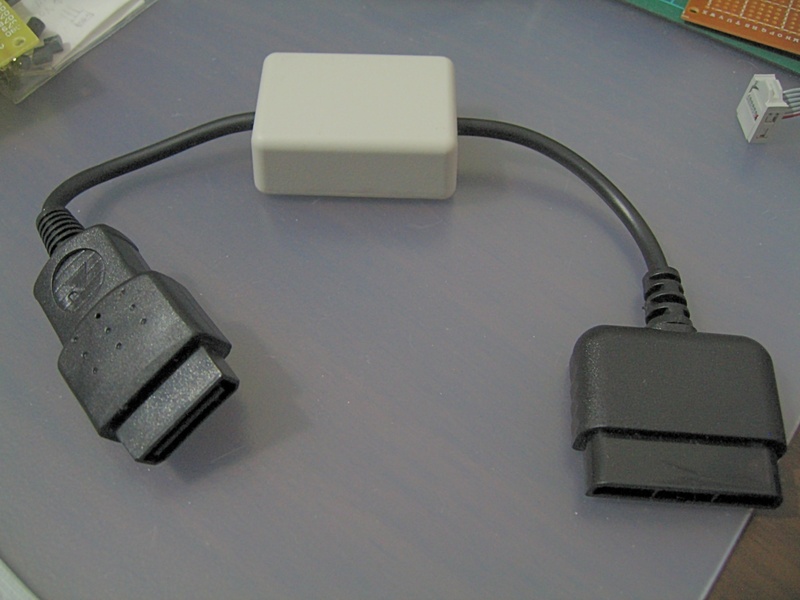 To select the desired button mapping hold down the appropriate button as shown in the table above when connecting the Saturn gamepad or when connecting the converter to the Playstation. For default mode do not press any button. The Start button is special. On it's own it does nothing, but if you hold Start and then press left on the d-pad you get Select on the Playstation. If you hold Start and press right on the d-pad you get Start on the Playstation. The only exception is Mode B (Select) where there are separate Start and Select buttons. 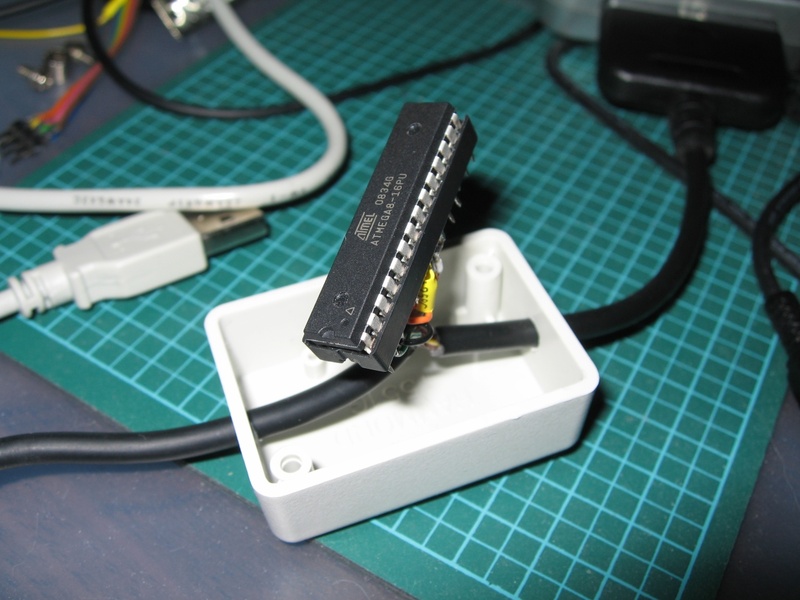 Holding Start when connecting the Saturn pad or converter selects Tournament Mode. In Tournament Mode the Start button is mapped to Select on the Playstation (no need to hold left or right on the d-pad). This prevents you accidentally pausing the game during a competition. Autofire is also disabled. Holding L or R when connecting turns on autofire for / / / . L sets slow speed and R sets high speed. When autofire is turned on by default it is activated when the R button are pressed (i.e. buttons work as normal but switch to autofore when holding R). By holding Start at the same time as L/R autofire is on all the time and turned off by holding L/R. 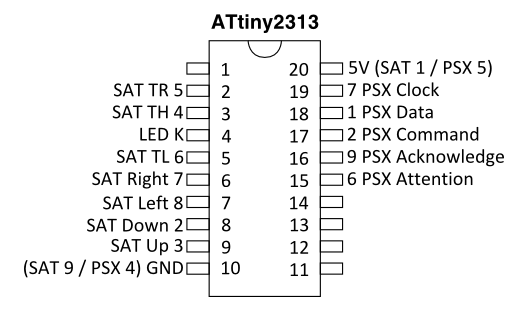 In Mode Y (Autofire) A/B/C/L are normal buttons and X/Y/Z/R are the same buttons but with autofire. Optionally connect the 10µF capacitor across 5V and GND, with the negative side towards GND. In my experience it is not required. You can build the circuit on matrix board or even by just soldering the wires to the legs of the IC socket. 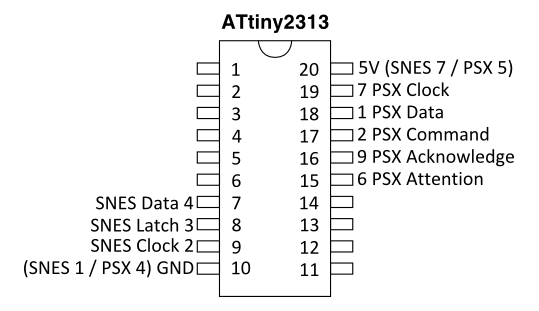 Official Nintendo SNES pads (Japanese, European or US style) are supported.